October is an ideal month to be in mood for spooky, mysterious reads and if you’re in search of an unsettling and creepily spellbinding story to read this month, look no further. 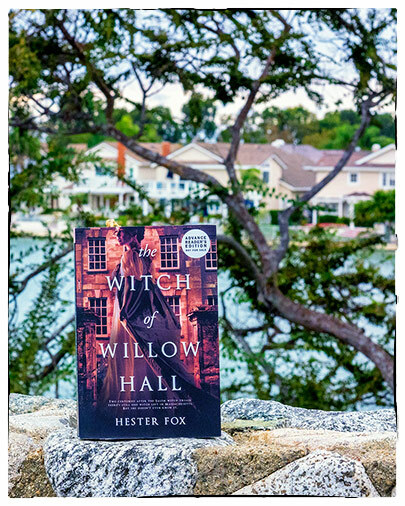 The Witch of Willow Hall by Hester Fox is an exquisitely written gothic tale that would leave its readers intrigued and slightly spooked but completely satisfied. The historical aspect, creepy location and hints of the supernatural contribute to its dark undertone making the story quietly ominous. The year is 1821 and the location New Oldbury, a small town situated just outside of Boston, Massachusetts. The Montrose family with their three daughters have recently moved into the quaint, sprawling estate of Willow Hall. A terrible scandal involving the eldest, Catherine has led to this impromptu and sudden move to the country. The Montrose’ are trying to leave the past behind and start afresh. However, the seemingly quiet and idyllic manor is not as easy to settle in. Ever since the move the lady of the house, Mrs Montrose has not been in her element. The middle daughter Lydia is continually bothered by strange occurrences, inexplicable noises and an overall feeling of unrest. The youngest Emeline has become mysteriously obsessed with a pond and an old willow tree on the grounds. The house holds deep secrets and so does the family residing within. Adding to the mystery is a brooding handsome neighbor with secrets of his own. So many secrets! What are they? This is a gradually building, slow burning, atmospheric tale with an element of uncertainty since the very beginning. The author keeps the suspense alive with bits and pieces, a rumor around the scandal, a tiny unfathomable episode, a wisp of imagination, a slip of tongue. Outwardly nothing seems amiss, the characters go about their daily lives, but an unexplainable disquiet and distress is felt lingering in the air. And just like that a tragedy happens, sudden and inconceivable. Things start getting darker, the more questions are asked, the more convoluted the mystery gets. Until the very end, I had no clue how things will wrap up, but I was completely contended with the conclusion. One important thing to consider before going into this book is the your expectation. If you are expecting to read something with a lot of witchy stuff, dark spooky spells and major supernatural aspect, this is not the right book to pick up. Although there is more than a whiff of paranormal in the story, the witch angle is pretty short. But, don’t be disappointed, the story in itself is quite fantastic, it focuses on a lot more than just the supernatural. It is about family, about the bond between sisters and about embracing your true self. A gentle simmering romance is an added bonus. A character driven, curious and mysterious tale, The Witch of Willow Hall has it all, a scandal, a tragedy, heartbreak and romance, with a tiny bit of witchcraft. If historical gothic fiction is something you enjoy, this is the perfect read to curl up with on a rainy October night. I can’t wait to see what Hester Fox comes up with next. Disclaimer: An ARC was provided by Graydon House and TLC Book Tours in exchange for an honest review. All opinions are my own.